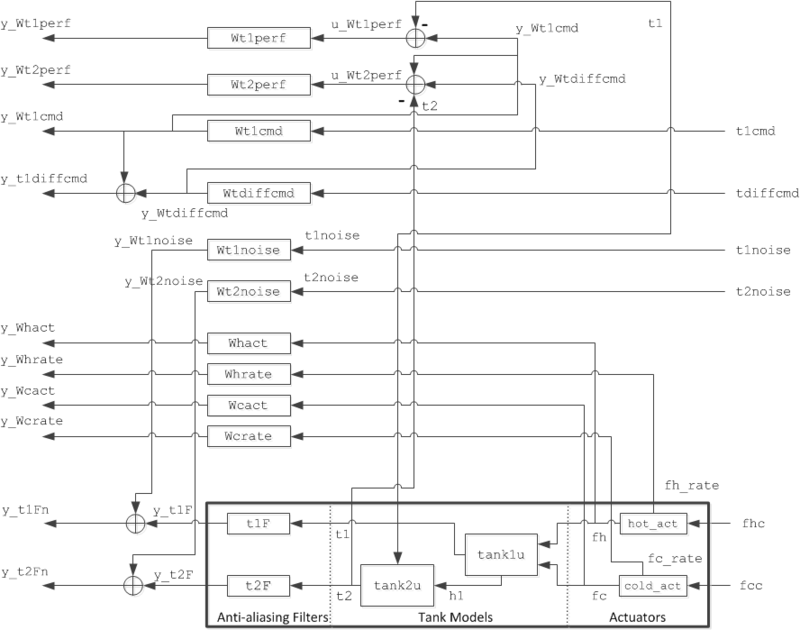 This example shows how to use Robust Control Toolbox™ to design a robust controller (using D-K iteration) and to do robustness analysis on a process control problem. In our example, the plant is a simple two-tank system. Smith, R.S., J. Doyle, M. Morari, and A. Skjellum, "A Case Study Using mu: Laboratory Process Control Problem," Proceedings of the 10th IFAC World Congress, vol. 8, pp. 403-415, 1987. Smith, R.S, and J. Doyle, "The Two Tank Experiment: A Benchmark Control Problem," in Proceedings American Control Conference, vol. 3, pp. 403-415, 1988. Smith, R.S., and J. C. Doyle, "Closed Loop Relay Estimation of Uncertainty Bounds for Robust Control Models," in Proceedings of the 12th IFAC World Congress, vol. 9, pp. 57-60, July 1993. The plant in our example consists of two water tanks in cascade as shown schematically in Figure 1. The upper tank (tank 1) is fed by hot and cold water via computer-controlled valves. The lower tank (tank 2) is fed by water from an exit at the bottom of tank 1. An overflow maintains a constant level in tank 2. A cold water bias stream also feeds tank 2 and enables the tanks to have different steady-state temperatures. Our design objective is to control the temperatures of both tanks 1 and 2. The controller has access to the reference commands and the temperature measurements. temperature   tunit          cold water temp. hot water temp. 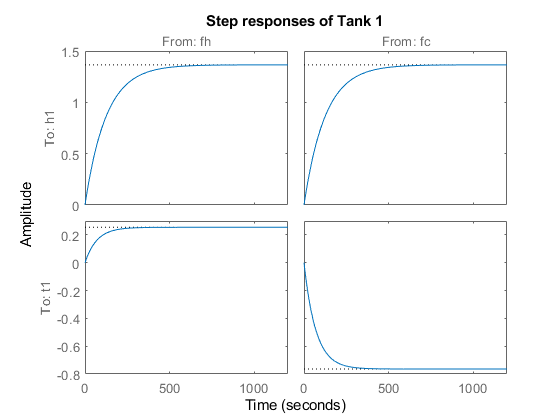 Figure 2: Step responses of Tank 1. 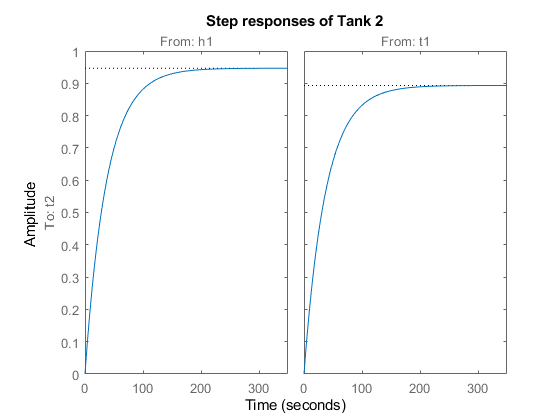 Figure 3: Step responses of Tank 2. There are significant dynamics and saturations associated with the actuators, so we'll want to include actuator models. In the frequency range we're using, we can model the actuators as a first order system with rate and magnitude saturations. It is the rate limit, rather than the pole location, that limits the actuator performance for most signals. For a linear model, some of the effects of rate limiting can be included in a perturbation model. We initially set up the actuator model with one input (the command signal) and two outputs (the actuated signal and its derivative). We'll use the derivative output in limiting the actuation rate when designing the control law. 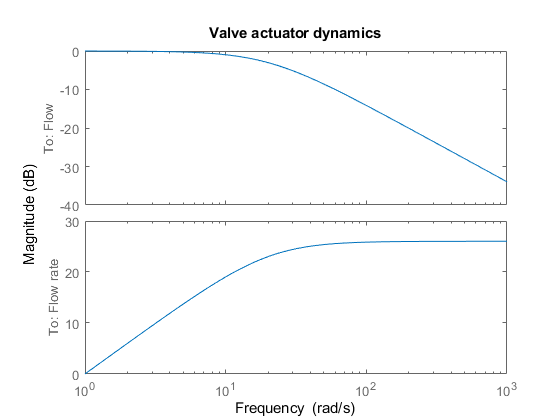 Figure 4: Valve actuator dynamics. All measured signals are filtered with fourth-order Butterworth filters, each with a cutoff frequency of 2.25 Hz. Open-loop experiments reveal some variability in the system responses and suggest that the linear models are good at low frequency. If we fail to take this information into account during the design, our controller might perform poorly on the real system. For this reason, we will build an uncertainty model that matches our estimate of uncertainty in the physical system as closely as possible. 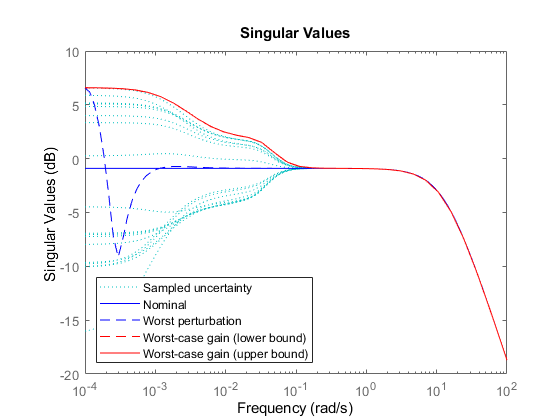 Because the amount of model uncertainty or variability typically depends on frequency, our uncertainty model involves frequency-dependent weighting functions to normalize modeling errors across frequency. For example, open-loop experiments indicate a significant amount of dynamic uncertainty in the t1 response. This is due primarily to mixing and heat loss. We can model it as a multiplicative (relative) model error Delta2 at the t1 output. Similarly, we can add multiplicative model errors Delta1 and Delta3 to the h1 and t2 outputs as shown in Figure 5. 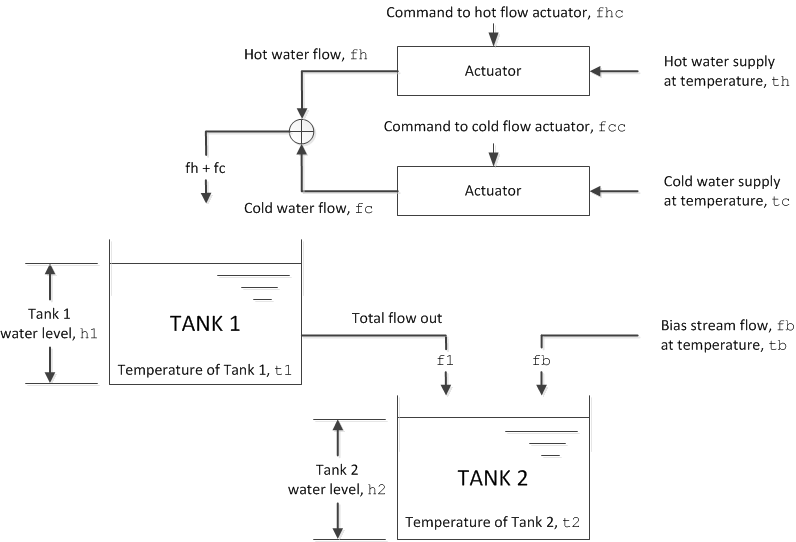 Figure 5: Schematic representation of a perturbed, linear two-tank system. The nominal model for h1 is very accurate up to at least 0.3 Hz. Limit-cycle experiments in the t1 loop suggest that uncertainty should dominate above 0.02 Hz. There are about 180 degrees of additional phase lag in the t1 model at about 0.02 Hz. There is also a significant gain loss at this frequency. These effects result from the unmodeled mixing dynamics. Limit cycle experiments in the t2 loop suggest that uncertainty should dominate above 0.03 Hz. This data suggests the following choices for the frequency-dependent modeling error bounds. 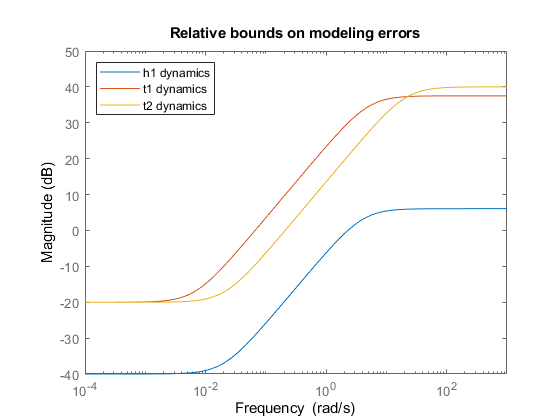 Figure 6: Relative bounds on modeling errors. Now, we're ready to build uncertain tank models that capture the modeling errors discussed above. 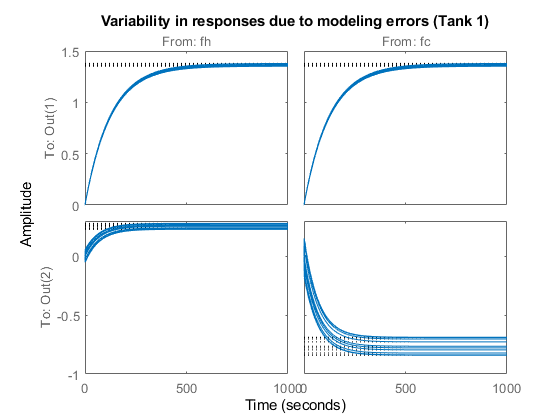 Figure 7: Variability in responses due to modeling errors (Tank 1). Now let's look at the control design problem. We're interested in tracking setpoint commands for t1 and t2. To take advantage of H-infinity design algorithms, we must formulate the design as a closed-loop gain minimization problem. To do so, we select weighting functions that capture the disturbance characteristics and performance requirements to help normalize the corresponding frequency-dependent gain constraints. Figure 8: Control design interconnection for two-tank system. Next, we select weights for the sensor noises, setpoint commands, tracking errors, and hot/cold actuators. The error weights penalize setpoint tracking errors on t1 and t2. We'll pick first-order low-pass filters for these weights. We use a higher weight (better tracking) for t1 because physical considerations lead us to believe that t1 is easier to control than t2. 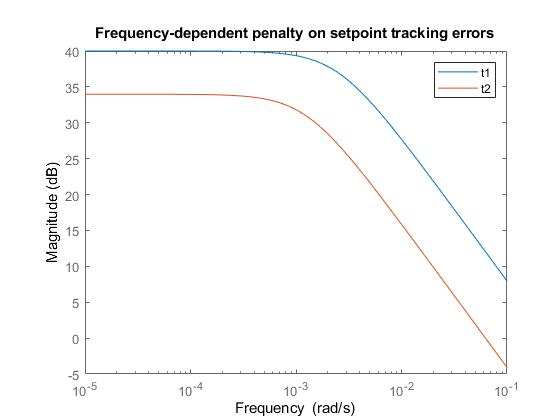 Figure 9: Frequency-dependent penalty on setpoint tracking errors. Finally, we would like to penalize both the amplitude and the rate of the actuator. We do this by weighting fhc (and fcc) with a function that rolls up at high frequencies. Alternatively, we can create an actuator model with fh and d|fh|/dt as outputs, and weight each output separately with constant weights. This approach has the advantage of reducing the number of states in the weighted open-loop model. Now that we have modeled all plant components and selected our design weights, we'll use the connect function to build an uncertain model of the weighted open-loop model shown in Figure 8. Uncertain continuous-time state-space model with 10 outputs, 6 inputs, 18 states. fcc = fcss/fs+y(:,5); % Limits (0<= fhc <= 1) etc. 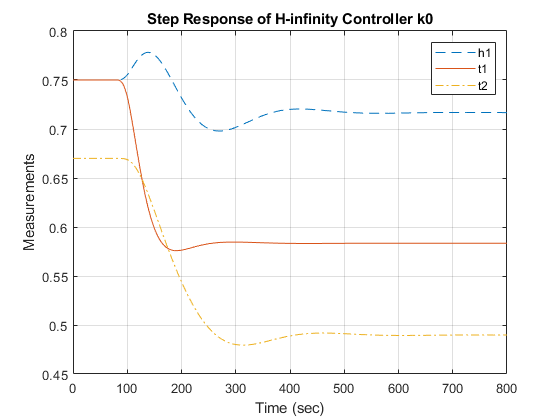 Figure 10: Step response of H-infinity controller k0. Next we plot the commands to the hot and cold actuators. 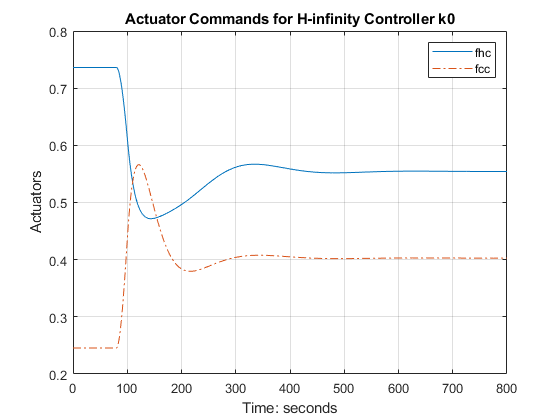 Figure 11: Actuator commands for H-infinity controller k0. Figure 12: Performance analysis for controller k0. The worst-case performance of the closed-loop is significantly worse than the nominal performance which tells us that the H-infinity controller k0 is not robust to modeling errors. To remedy this lack of robustness, we will use dksyn to design a controller that takes into account modeling uncertainty and delivers consistent performance for the nominal and perturbed models. 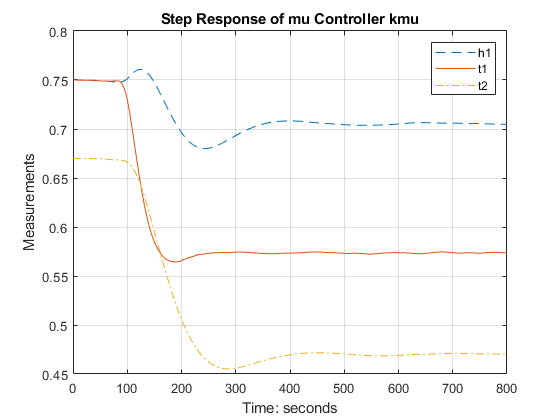 Figure 13: Step response of mu controller kmu. These time responses are comparable with those for k0, and show only a slight performance degradation. However, kmu fares better regarding robustness to unmodeled dynamics. Figure 14: Performance analysis for controller kmu. You can use wcgain to directly compute the worst-case gain across frequency (worst-case peak gain or worst-case H-infinity norm). You can also compute its sensitivity to each uncertain element. Results show that the worst-case peak gain is most sensitive to changes in the range of delta2.